On this website you can find some web applications together with comprehensive documentation, developed by Alexander Krebs. These software packages are also available for download and are provided free of charge. For commercial agreements and other licensing issues please contact the author. Additionally, a number of articles about different topics is available. 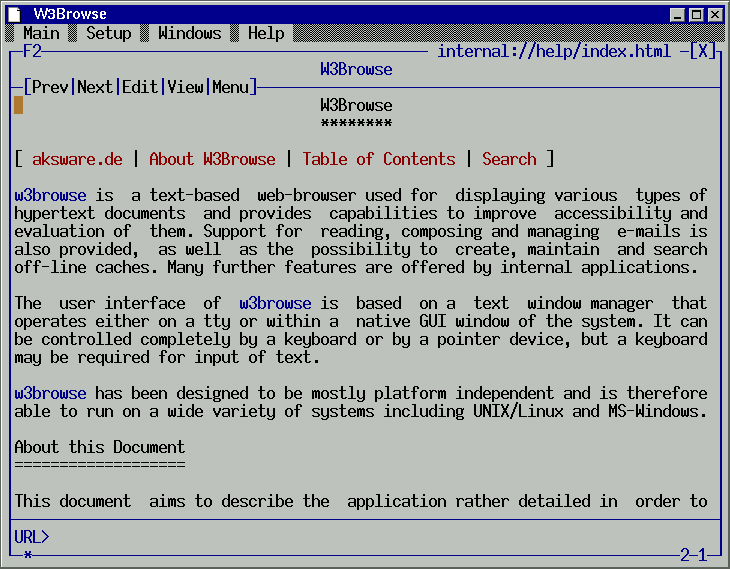 Screenshot of w3browse, showing the startpage of the documentation. Screenshot of w3browse, showing the "Table of Contents" on a small screen. Multiple separate HTML pages, which have also been incorporated into the application and represent the built-in help system. A single HTML file (about 400 KB), which serves also as a template for the PDF file. A single PDF file (about 640 KB), which is fully linked and well suited for single-sided and double-sided printing (thanks to html2ps 1.0b3, ghostscript 6.51 and the stylesheet pdf.css). 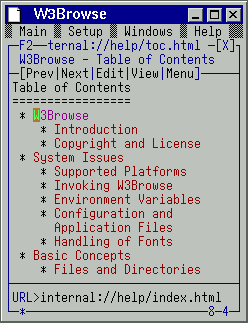 The user interface of w3browse is based on a text window manager, operating either on a tty or within a native GUI window of the system. It can be controlled completely by a keyboard or by a pointer device, but a keyboard may be required for input of text. W3bView - a text-based web-browser. This is a slimmed version of w3browse with all the other features omitted which are additionally provided by w3browse. The configuration file of both applications is the same and can be shared between both of them without problems. The applications are available on the download page.